It is fair to say that all of my client’s love their fishing, but I would have to say that Johnny is a in a different league! Indeed, he had even arranged picking up a brand new car around his two guided sessions (on consecutive days) with me! We met on a damp, dull and blustery morning with a view to fishing a favoured area of snaggy, shallow reef interspersed with some lovely deeper gullies – the perfect hideout for a hungry bass. The extremities of beaches are very often excellent venues to fish as the tide ebbs. Unique to the seashore of course, is that you can very often stand (at low water) in the exact spot where you’ve caught a bass. And when you consider that ‘what to look for in a potential bass mark’ is very high up on the list of what my clients would like to learn, then having the ability to do this greatly assists the learning process. Indeed, as we scrambled through exposed gullies and rock pools, I was able to explain to Johnny ‘how’ and importantly ‘why’ I believed bass had been caught from certain areas – adding that if you catch a decent bass from a particular section of reef, then in similar tidal and sea conditions you can expect to encounter another one. Something else that I enjoy doing when I’m guiding is taking the time to look through my clients’ lure collection(s). I put a lot of thought into deciding what I should take out on my solo sessions therefore, I can completely appreciate the time and (especially) money that goes into other people’s. Furthermore, I also understand that if someone catches a bass on a lure that they have purchased, then it is probably more satisfying for them, than using one of mine. The sea conditions were ‘lively’ but comfortable for lure fishing during this session. With around 2ft of water clarity and a 2 – 3ft swell swishing some beautifully aerated water in and around the rocks – there was serious potential. It was for all the reasons above that I suggested to Johnny that he attach one of his 140mm, 25g Xorus Patchinko surface lures (in the Silver Black colour). The amount of movement present warranted a decent size lure, plus in the back of my mind was the amount of bait fish still in the area – the bass I thought, would still be very much in the mood for taking easy pickings ‘off the top’ as it were. The first mark allowed Johnny the opportunity to cast into three different areas. What I’ve generally found, is that bass will wait or hold in certain areas as the tide ebbs. Therefore, having the ability to explore as many gullies or areas of reef from one vantage point is extremely advantageous. One of the hotspots is a ‘V’ shape gully or inlet, which at this stage of the tide is approximately 12ft deep, with a sandy seabed and with walls (fingers) of rock either side. 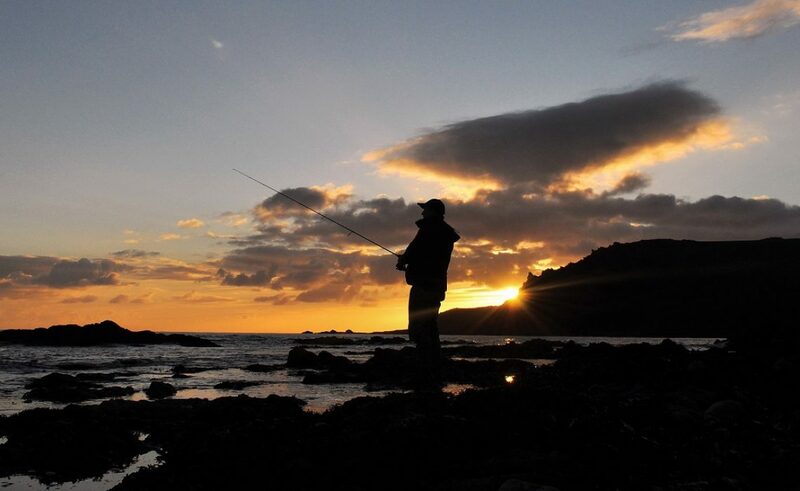 Very accurate casting is required here, in addition to a slice of luck when it comes to landing any fish – as there is a series of rocks right in front of your stance and only a narrow (4ft) gully to bring any hooked fish through. It was obvious from a few test casts/retrieves that Johnny was very adept at ‘working’ the ‘big patch’ therefore, following a few exploratory casts (with a shallow diving minnow into a nearby sandy gully) he made his first cast into a real cauldron of water, that was being pushed through by the swell. Hooking it was the easy bit! The lure just looked so inviting! Twisting, spluttering and snaking across the surface it looked every inch a wounded, struggling fish and a very easy meal… 10 casts in and I witnessed an almighty swirl and splash (which Johnny didn’t see!). The rod was pulled around strongly, really catching Johnny unawares – to the extent that he thought he had snagged a rock (was his comment later in the session). The bass did what I expected it to – drag the line across the nearest rock!! With Johnny doing his utmost to get his bearings and identify where the fish was in relation to the rocks it was too late… the bass grounded itself on a platform to the left of the gully. I had no choice – I was stood on a higher plateau of rock therefore, I grabbed the rod and attempted to ‘bounce’ the line (and the hooked bass) in tandem with the backwash of the swell – success!!!!!! Karma yet again – for the many bass that escaped this season. With the hooked bass safely manoeuvred off of the rocks and powering (taking line) in a less worrying direction I handed the rod back to Johnny. From there he controlled and steered the fish around nicely, before ‘guiding’ it beautifully through the narrow gully. The fish wasn’t finished yet though, attempting to dive for a weed bed about 6ft under the surface, before completing the obligatory thrash on the surface and parallel run to the left and then right – it was a very decent fish that did not want to be landed! My netting skills have improved (they had to!) and the next time it came up on the surface in front of us I quickly pounced to scoop it up – in she went, first time. To say Johnny was ‘flabbergasted’ is an understatement… It was by far the largest bass he has caught from the shore and at 59cm was a real powerful brute. You could feel the strength in its body and Johnny had to really grip the fish tightly in order for me to take a couple of quick photographs. Placing her gently back – she was gone in a flash. Physically shaking with excitement, I suggested that we take 5 minutes just to take in the moment. A brute of a bass measuring 59cm (around 5lb). I don’t thin he really expected to catch one this big. Following another scramble around a freshly exposed reef, the next mark is long promontory of rock, jutting out in the tide but with sandy patches below around 7 – 9ft of water. This time, a Fiiish Black Minnow was gently lobbed into what has been a very consistent bass spot. Johnny was using the 12g jighead/120mm version in a sink and draw fashion ensuring that the jighead was ‘tapping’ the seabed all the way to his stance on one retrieve. He then alternated between a ‘bouncing method’ ensuring the lure tapped on the seabed 3 – 5 times and straight retrieving it slowly thereafter on the following cast/retrieve. 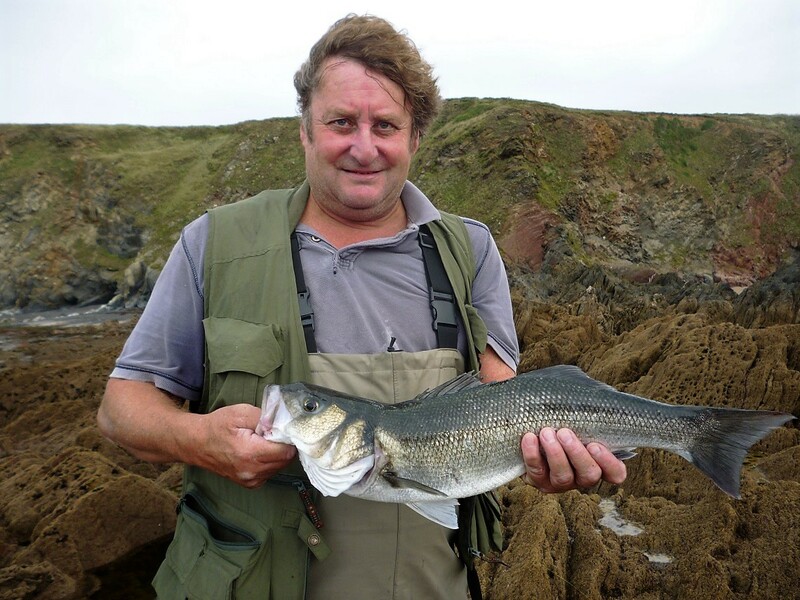 It took around 15 minutes, just as the tide was beginning to reach its low point when a small bass hit the lure as it was lifted off the seabed – unfortunately, the fish managed to wriggle off. As the tide turned, I asked to Johnny to change the lure back over to the big patchinko – but it disaster struck! But with Johnny staying in south Devon for the next few days, he had already booked me in advance for an evening/night session the following day – one which was to prove rather special for me personally… But for now, it was time to congratulate Johnny on smashing his PB bass – he was a very happy Man to say the least. Johnny had wanted to experience some night lure fishing therefore, I took the short window of opportunity (around some household choirs) to visit a venue that I knew would be absolutely perfect for (hopefully) a decent bass – due primarily to the moderately rough sea conditions caused by the westerly wind having increased overnight. I will save the full story for a full Blog Post (that’ll write in the next 2 weeks) but let’s just say that it was a bass that I’ll never forget! Sneak preview of my personal bass best – I was pretty pleased as you can see! I will write a separate Blog Post covering this momentous (for me) catch very soon… I promise! With my own PB reverberating around my head I met up with Johnny at around 1930 for an evening/night session. Initially, he would be utilising small surface lures (again, due to the amount of baitfish in the area) and then white senkos, Albie Snax (more on them in a later post) and needlefish. Although we were fishing from a shingle beach, there is a strong current that runs parallel to the shoreline here, in addition to a reef that occupies a 200 yard stretch of beach, just beyond (5 – 10m out) from the shingle – a great ambushing mark for the bass and angler alike. Johnny working a small but very effective surface lure (Xorus Patchinko 100) as the light and showers faded. As we gradually moved along the shoreline, the little surface lure did its best to immitate small ‘skittering’ baitfish – to the extent that after 20 minutes (following a short pause before he lifted the lure out of water) a small bass grabbed it in true (splashing) fashion. Everything looked right – a flooding tide (good on this mark), the wind had dropped out, a half Moon was due to appear above the horizon about an hour into full darkness and the water was free of floating weed – something that was present on many of my ‘night marks’ due to the very strong westerly in the previous 24 hours. Depending on the conditions (water depth, clarity, waves, swell and type of ground) I generally start a night session with the most subtle lure I have – a 6″ senko. Ths is then followed by an Albie Snax, then a needlefish and then a very shallow diving rattling minnow if I think the bass are more likely to be sensing vibrations. But the only lure that induced a take in the gloom was the Jim’s Lure Needlefish just as the tide turned, some 3½ hours into the session. It was being fired uptide into an area where the underwater reef begins but the fish (a bass presumably) was only connected to the lure for around 15 seconds – a real pity as Johnny said it felt pretty decent. I thoroughly enjoyed Johnny’s company and humour, and his sheer passion for his fishing was something that I really admire and which many of us can relate to of course. Lots to look back on – PB bass, broken rods, great stories, a good old laugh and as he very kindly put it – from his perspective, learning how to catch bass from the shore was a complete eye opener. Previous Client Catches – Fly fisherman converted! Now that looks like a good fish Marc! Looking forward to reading more about it. Chop, chop! It was a cracker Andy! !